The canal in blue down the side of Charlotte Street and Whitmore Lane. The Custom House bridge is middle-left. This blogpost is part of a series looking at offshoot themes from my book 'Notorious' that recounts the lives people living on Charlotte Street and Whitmore Lane in Cardiff from 1841-1870. It contains mature content. The introduction to the notorious streets can be found here. The black ribbon, the Glamorganshire Canal, wound it's way down through the Taff valley from Merthyr Tydfil to Cardiff docks. 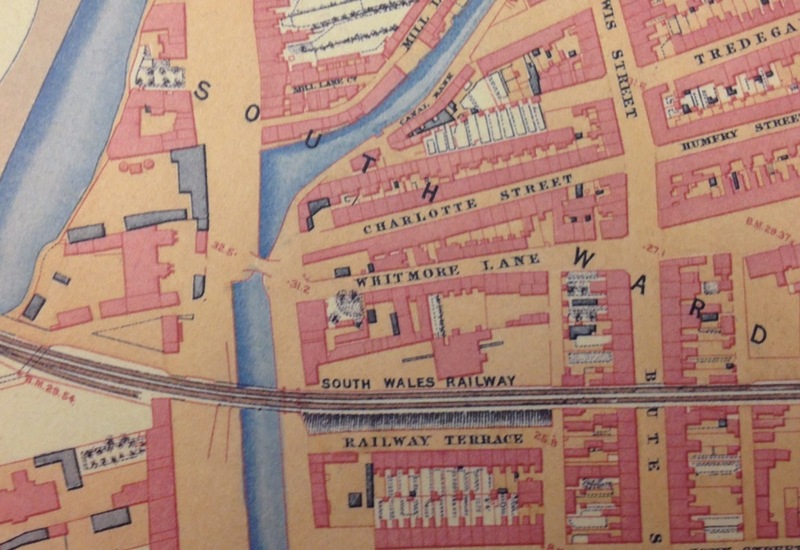 Charlotte Street and Whitmore Lane were bounded to the west and north by the canal and it had a large influence on the society that lived there, employment only being a small part. It is no coincidence that the other two main areas of prostitution and vice in South Wales, China in Merthyr and Friar's Fields in Newport were also both within close proximity to canals. 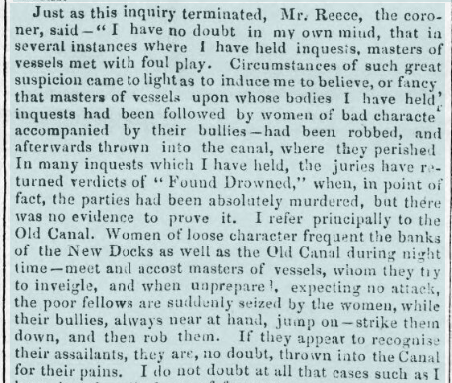 When historians write about canals, such as in the two volume 'Glamorganshire and Aberdare Canal' by Rawson and Wright, they neglect to mention the dark influences the canal had on the societies that lived alongside it. Of course foul play could never be proved. The Black Ribbon had two other social uses that its makers never intended, suicide and the dumping of babies and foetuses. 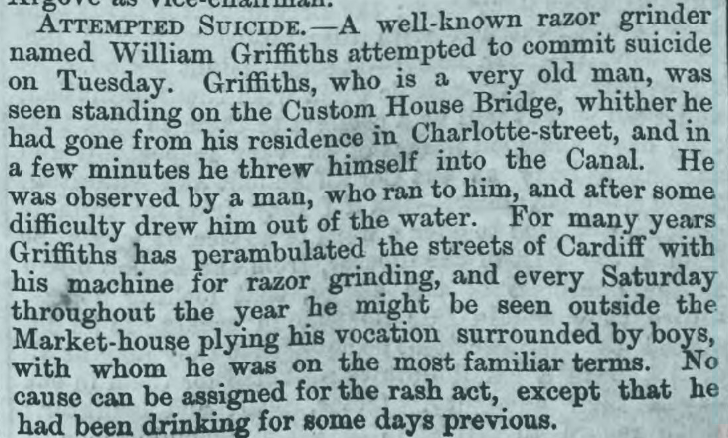 Suicide was of course a crime at this time- hence the five shilling and costs fine (about a weeks rent). She was taken back to Prothero's brothel and continued to work the streets for another five years. In March 1857 Annie McNelly age 22 was assaulted by a brothel keeper and his wife and another working girl called Bella King on Christiana Street. At one point the man slammed her head in a door and she ran off and into the canal. She died. The man William Roberts was charged with her assault and got three months in gaol, the women were freed. Hannah Phillip's case is interesting as she is evidence of a 'fallen women' who was literally brought up in the environs of brothels and prostitution for most of her life. 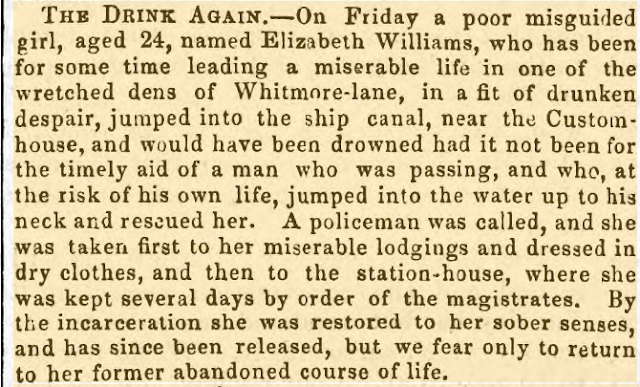 1866 saw a mix up where the prostitute Eliza Lewis was found dead in the Junction Canal off Bute Street. See here for The Twelve Day Death of Eliza Lewis. In 1867 'a woman named Grey' tried to commit suicide by the Hayes bridge (the next one up from the Custom House). She is probably Mary Grey. Again in 1867 Sergeant Price saw Elizabeth Long running towards the canal. He ran after her and caught her 'by the hair' just as she was in the act of jumping in. 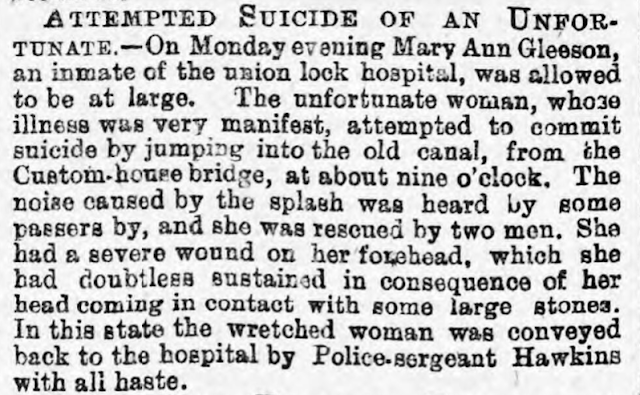 This was the third time she had attempted suicide by jumping into the canal. The last suicide attempt takes us full circle in a way. John Gleeson attempted suicide in 1850- he opens this section of the blog. Almost 30 years later in May of 1879 his daughter Mary Ann Gleeson, who had been working as a prostitute, jumped in at exactly the same spot. The lock hospital mentioned was for venereal disease. The way they say her 'illness was very manifest' means that she was probably in the last stages of syphilis- her body was being eaten away by sores and infection and she was using a crutch to walk. 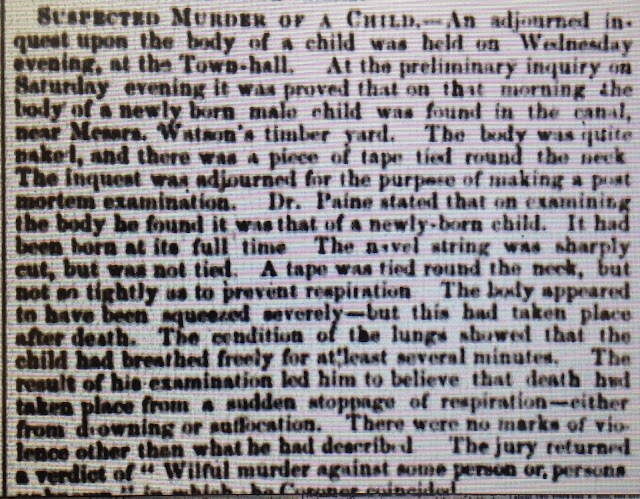 I have found only one reference, in 1842, to a baby's body being discovered in the privies (outside toilets) of Whitmore Lane. Considering the huge number of brothels and prostitutes on Charlotte Street and Whitmore Lane there must have been a high rate of unwanted pregnancies, still born and aborted babies. Many of the working women worked right up to the birth of their children, for example Sarah Nips was with a client the day before she gave birth in 1852 and Ann Arnott was working in Mrs George's Dinas Arms brothel until two weeks before she gave birth in 1868. We have recorded the still-born birth of a child of Jane Allen, a Whitmore Lane prostitute, who gave birth in Mrs Donovan's brothel at 24 Whitmore Lane in 1856. The baby was put into a box and placed under the bed while the midwife attended to the mother. 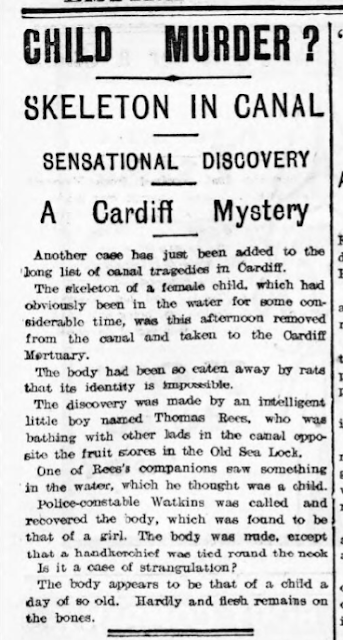 If the police had not turned up after hearing the rumours I wonder where that box would have ended up, perhaps the midwife would have buried it, what is certain is that many unwanted babies, still born or not ended up in the Glamorganshire Canal. This servant called in the police, but often these babies were born in dark, secret places to poor and desperate women. Who knows how many ended up in the canal. I'm not saying that they all came from the women and brothels of Charlotte Street and the Lane, we'll never know their stories, but it is likely that many did. Falling into the canal was not always intentional, it was in fact a frequent occurrence. We begin with a 16 year old boatman man falling off a barge while partying with friends and some lady guests by Whitmore Lane. They took his body to Caroline/Catherine Mouls' brothel on Whitmore Lane. You don't have to be a historian to understand that these children were missed, no matter how poor or inconsequential their parents were. 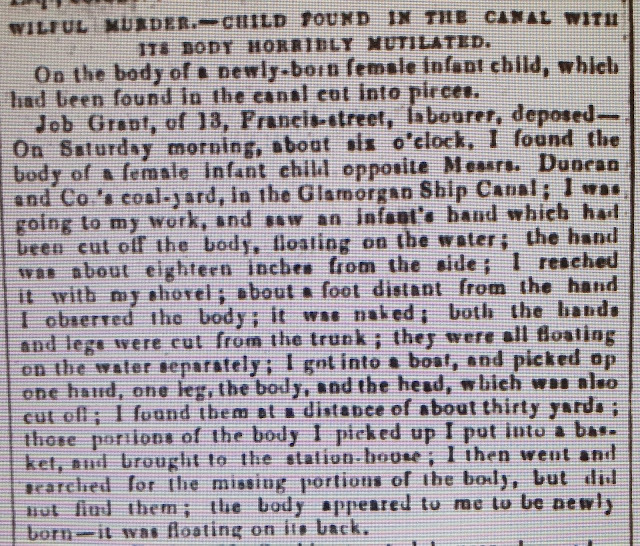 I'm sure Bridget Kirby's widowed father, who was a labourer lodging at Whitmore Lane, missed his five year old daughter after she went to play on the Thursday and was found lifeless in the canal on a Saturday morning in 1855. Elizabeth George, the landlady of the Dinas Arms on Charlotte Street, almost lost her son George to the canal shortly after moving to Cardiff in May 1858. The brothel keeper and prostitute Susan Stanton wasn't so lucky. 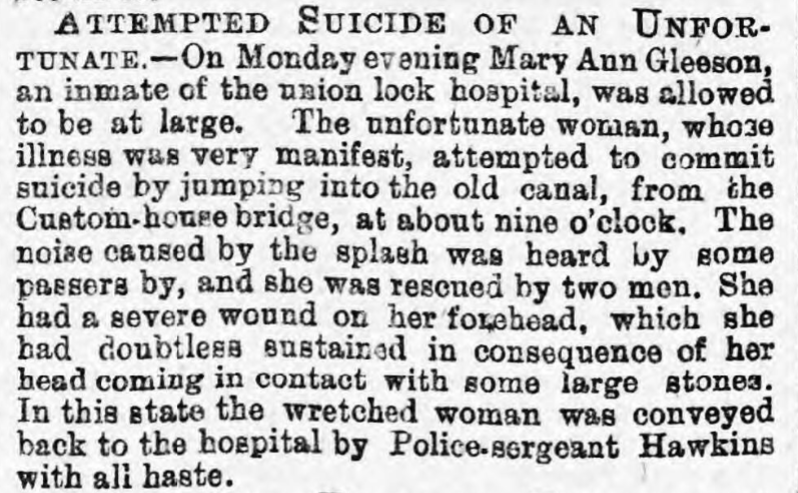 Her four year old son, a grandson of Mary the Cripple, fell from a narrowboat into the canal on an April afternoon in 1859 and was only found when his dead body resurfaced many hours later. The reports are in the hundreds. I'll end with this article from 1907. I've always been interested in the Glamorganshire Canal, having lived alongside it's path at one point, and have been dismayed at the destruction of it over the years. Very little remains of it today, most disappearing under the A470. I never realised how much blood and pain had soaked into it's clay lined channel over the years. 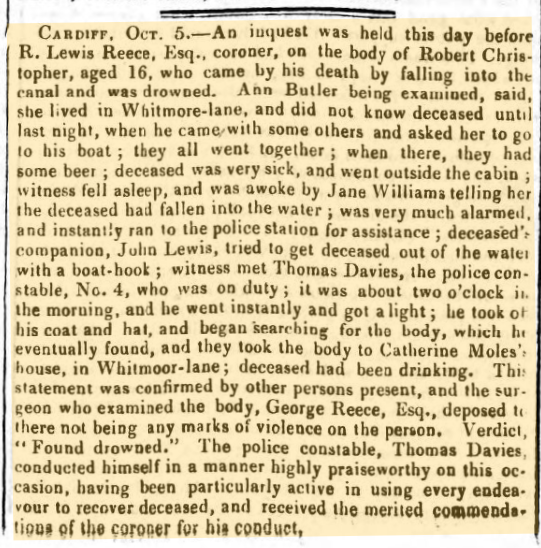 Captain death inquest: 1842 October 8th Cardiff Merthyr Guardian p.3. 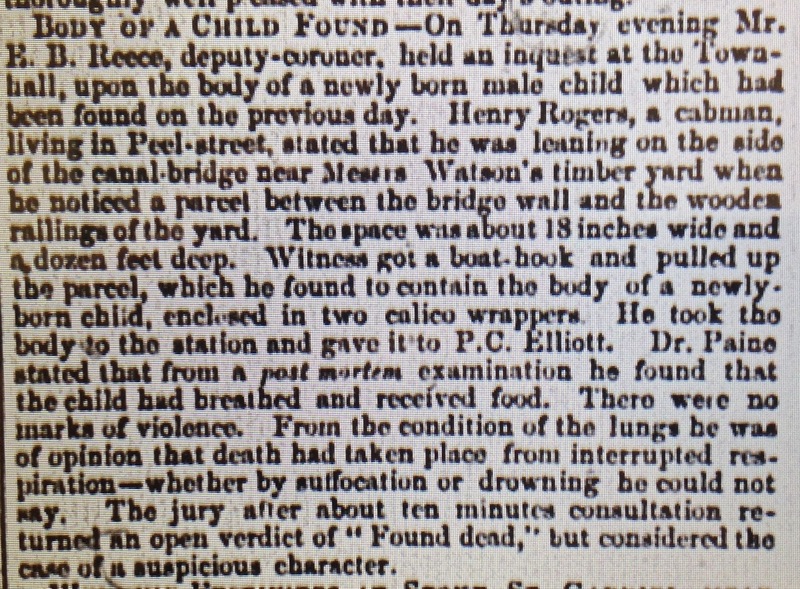 Coroner's report: 1846 January 3rd CMG p.2. Merthyr Man's death: 1864 May 20th Cardiff News p.2. John Gleeson suicide: 1850 April 20th CMG p.4. & Monmouthshire Merlin p.2. Ann Moore: 1854 June 9th CMG p.3. Naomi Oram suicide: 1855 July 7th CMG p.5. 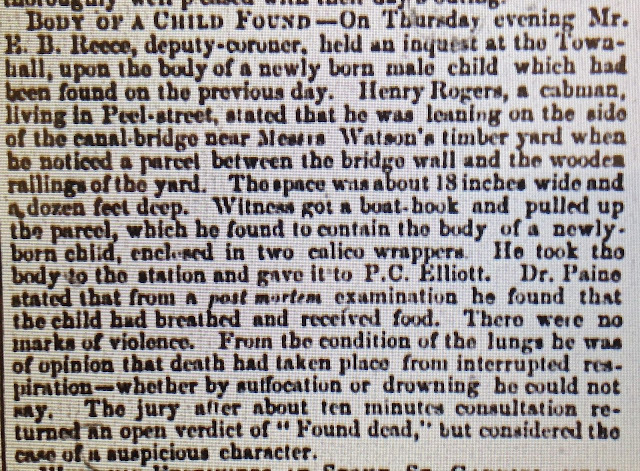 Annie McNelly: CMG 1857 March 14th p.8. Ellen Griffiths: 1857 June 27th CMG p.5. 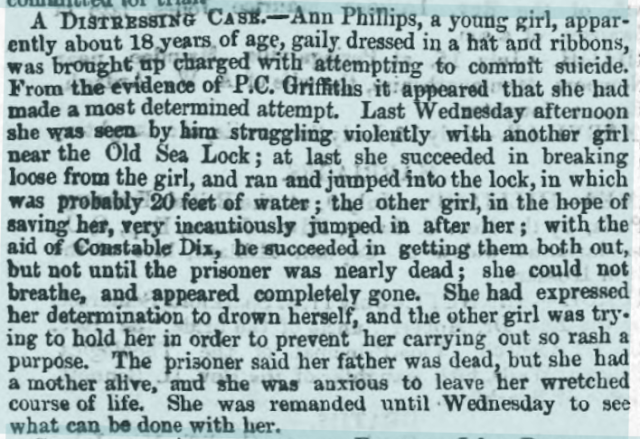 Hannah Phillips: 1861 July 19th Cardiff Times p.8. 1861 July 20th CMG p.6. Hannah Phillips Census 1861 St Marys Cardiff RG9/4033 F85 p55. Hannah Phillips: See also 1859 July 9th CT p.3. Elizabeth Williams: 1862 Sept 13th MM p.6. Earlier see 1857 July 4th CMG p.6. Grey: CT 1867 July 13th p.6. for Mary Grey see CMG 1865 March 31st p.6. Elizabeth Long see PSCBO/1/49 30th July. Margaret Mahoney: 1868 February 1st Cardiff Times p.5. William Griffiths: 1869 July 10th CMG p.5. 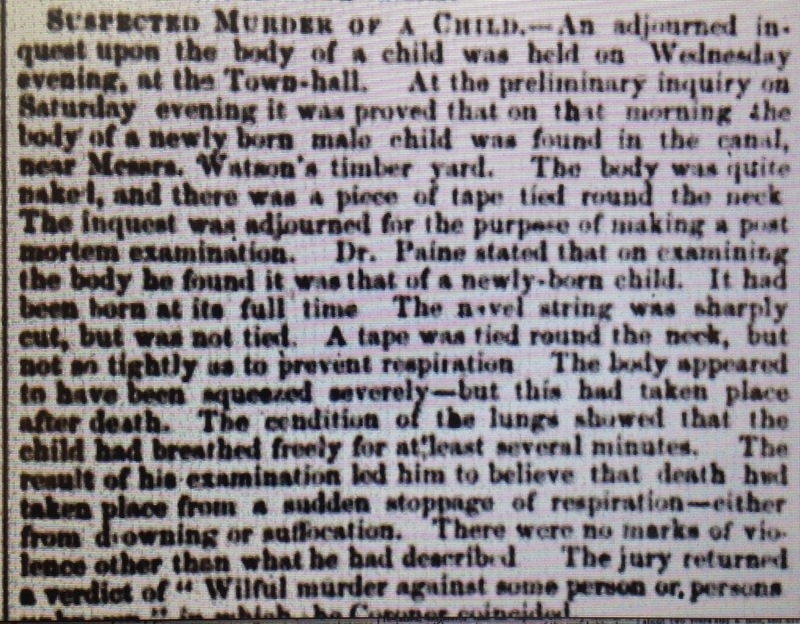 Kate Martin: 1871 October 25th Western Mail p.3. 3rd time Oct 28 CMG p.5. Kate Martin: There's a long list of previous convictions e.g. 1862 July 25th CT p.6. Mary Driscoll: 1855 November 10th CMG p.3. 1855 July 28th CMG p.8. 1857 Jan 17th CMG p.8. 1858 Feb 27th CMG p.5. 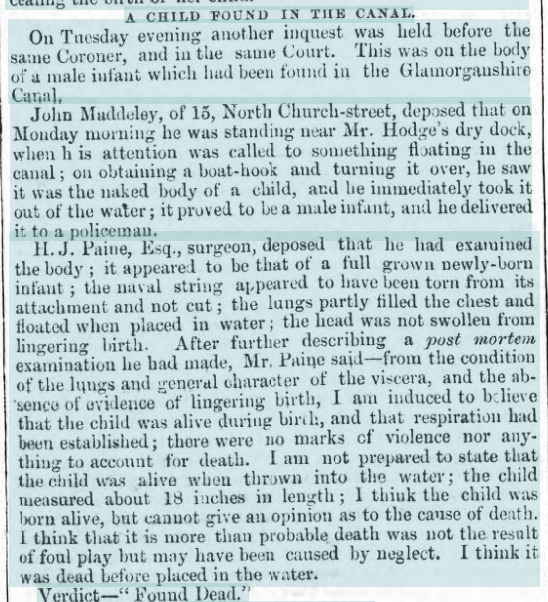 1868 January 25th Cardiff Times p.3. 1868 June 27th Cardiff Times p.5. Something like a Bull: 1850 August 17th MM p.3. Margaret Griffiths: 1858 July 31st CMG p.6. Taken in for 'obstructing the pavement' 1854 June 23rd CMG p.3. George George: 1858 May 15th p.5. 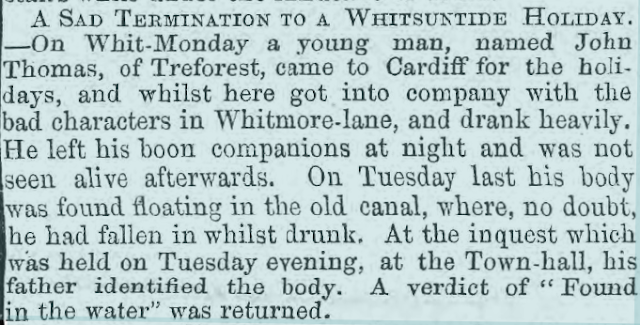 John Thomas: 1860 June 9th Cardiff Times p.5. John Jones: 1868 April 25 Cardiff Times p.5. Last article Evening Express October 5th 1907 p.3. Map is from the Glamorgan Archives, the newspaper reports are either from the excellent Welsh Newspapers Online site from the National Library of Wales or from microfiche at the Cathays Library in Cardiff. The book 'Notorious' is almost completed, I'm just adding some final evidence from birth, marriage and death certificates that I need to order, and painting the portraits of the characters within it. This post in its current form is copyright Anthony Rhys 2017.